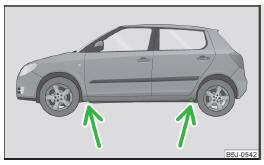 Position the car jack below the jacking point closest to the flat tyre » Fig. 142. The jacking point is located directly below the engraving in the lower sill. Wind the jack below the jacking point with the crank up until its claw is positioned below the vertical web of the lower sill. Offer the jack up so that its claw encloses the web » Fig. 143 - . Support the base plate of the jack with its full area resting on level ground and ensure that the jack is located in a vertical position at the point where the claw encloses the web » Fig. 143 - A. Continue turning up the jack until the wheel is just about lifted off the ground. Only raise the vehicle at the jacking points.